We’re finally getting rain here in Central Florida and seeing the quick results in our landscaping. Irrigation sprinkler systems are a great tool in keeping lawns and plant material green throughout the year, but a drought can undoubtedly stress both the system and the landscape. While they provide a bridge between natural rainfall and watering by hand, excessive rain in the area can have a negative effect: waterlogged yards. A great addition to any sprinkler system is a rain sensor. These units operate by gauging rainfall and overriding a system’s cycle to keep excess water from reaching turf and plants. Signs that point to too much water include yellowing plants or unusual insect activity. Water conservation is an important part of being a Floridian. Surrounded on three sides by water, less than 2% of the Earth’s water supply is fresh water. It should come as no surprise that rain sensors offer big savings on water by skipping watering cycles after moderate to heavy rain. Your irrigation sprinkler system will benefit by not running unnecessarily and water won’t be wasted. 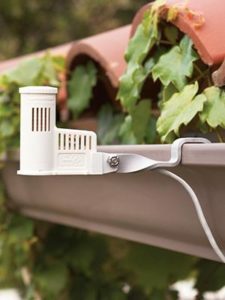 Rain sensors are an affordable addition to your system that result in water savings and reduced water use. Call today to schedule your rain sensor installation for as little as $115!